As I was driving over and had the room I put a couple of other models into the car to enter into the contest, If I was travelling all that way it made sense to bring a few things along and take part. I was surprised to pick up a Silver in the OOB section for a FISTV I had made and mentioned here earlier in the year. As that was taken as an after thought, it does prove that contests are fickle and you never know what is going to take the judge's eye. Just don't take it all too serious or you'll stop enjoying the hobby. These are wise words, as I have read of some unhappy contenders from this years IPMS Scale Model World (SMW) who have taken the judges to task over their decisions. Isn't that spoiling the point of a hobby? and making hobby contests less fun? The enjoyment should be measured in the satisfaction the model has given to the builder and the viewer, not about how many medals it has gained. That's my view and I still enter one of my favourite 1/48 dioramas in to modelling competitions because it is a favourite, despite it never even gaining a commended let along a gong. 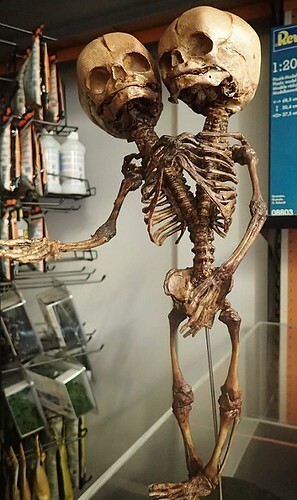 The end of October saw Halloween bring some odd items into the shop. 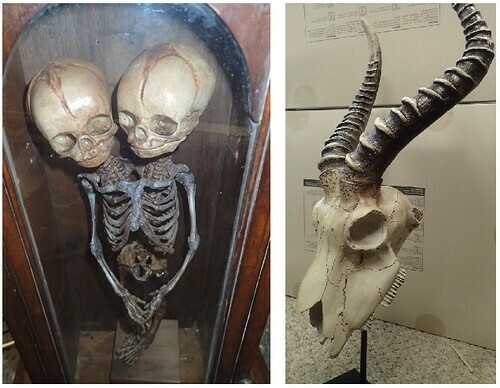 Repairs to a rams skull and re-positioning a two headed skeleton so it could fit into an ornate case. They both looked the part when done but even before they were completed and back to their respective owners further repairs and commissions had come in. I have had to put a sign up stating no more repairs or commissions until at least Feb 2017 as I have to many things waiting for my attention and December is when I have the least amount of spare time. I did divert some hours to a task that while needed for the shop was also very enjoyable for me. 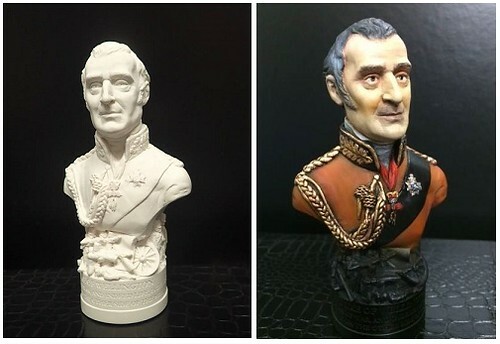 I had been made aware of some fine British heritage busts made by a fine arts sculptor in Bath. Produced in Gypsum plaster it struck me that we already stock diorama bases and buildings made from plaster and it is excepted as a medium to paint, so why not figure busts? The only way to prove it was paint one myself and have it displayed along side. Sherlock Holmes was my favourite piece but the tweed of his jacket would have taken a long time to paint so I decided on the Duke of Wellington. It was a joy to paint, done over 3 days but about 9 hours in total. After priming with Army painter black spray except the face which received Model Air Mahogany, Humbrol enamels were used for the golden strands and Acrylic for the face and uniform. I'll do another no doubt as the best thing is the price £18.99. Far less than an equivalent resin bust. Each one is approx. 13cm tall so i'm guessing the heads are about 1/6 maybe larger. 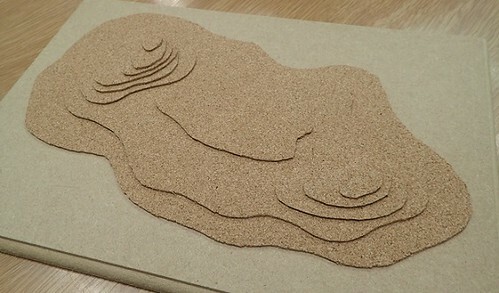 The final picture is taken of a school project done with materials supplied to a young visitor to the shop. A very neat interpretation of how map contours work, and it took me back to my Army days before lessons were delivered on power-point. He has done a great job. I wont get a chance to blog again until next year so hope you all have a great Christmas, receive the kits you want and get some building done over the break, I know I'll be attempting to. Best wishes for 2017. 29 Sept 16 A topical start to this blog as I have been reading on some of the internet modelling forums that Francois Verlinden has retired and perhaps gaining the most attention is that it has been reported the moulds for the ground breaking model products he was famous for have been destroyed. That is an odd coincidence as these past few weeks I have been using some of Verlinden's Vietnam figures in a diorama i'm currently building. I have not used Verlinden's products much in my model making life but do remember the first time I purchased one of his resin kits. It felt like I was becoming a true model maker as this meant a lot more than buying an Airfix kit from Woolworths. He used a deep cream coloured resin that had a distinct smell, and while I was cutting off casting blocks the smell rekindled the joy of youthful model making. I should state that resin dust is dangerous and that I certainly don't suggest sniffing resin as a past time but none-the-less it was a blast from the past. What ever the story behind the forums, Verlinden was the initiator of what we now take for granted with after market extras or resin figures. The model I'm using the figures on is Tamiya's recent M107, which is in fact Italeri's kit in a Tamiya box with a few added extras. One figure remains as intended the remaining have been blended with Academy and Trumpeter parts. The whole thing sits in a slightly modified GNR plaster cast revetment. It is very close to completion with some minor vehicle details to place and two final figures. As well as attending to all the usual shop matters, and the commissions and repairs that really take up a lot of time I do still squeeze in some modelling as the diorama above proves, though my personal output is pretty poor these days. I wrote over a year ago that I was going to invest weekly in the 'Build the Millennium Falcon' part work, justifying the high overall cost to the fact that it would force me to spend about 10 minuets a week on modelling and i'd see clear evidence of progress. Hmm... That was the theory in reality the collecting has gone well, we are now on issue 91, with just 9 to go. It dawned on me that I hadn't even opened most of the issues and I could be unfortunate and have parts missing that I wouldn't know about until to late. With my wife away in London over my day off I decided to take over the living room floor and lay out the 90 issues so far. It was slightly over whelming but at least a start was made. I've reflected on the odd repairs I have undertaken, but the following repair, while quite simple, is probably the oddest I have ever had. It is a prop, not a real specimen I should add, as that would be to weird. The work will feel more like surgery as I am having to re-pose the little fellow ready for Halloween. I don't think i'll put it in the shop window as I often do with completed repairs, it will scare off the kids. buying a digital camera that had a subtle twist to it's macro function. As well as being able to perform close up shots like most digital's, to give a deeper depth of field it would shoot a number of successive shots and merge them together. It is only a slight difference but as the picture below shows it increases the sharpness of the image nicely. 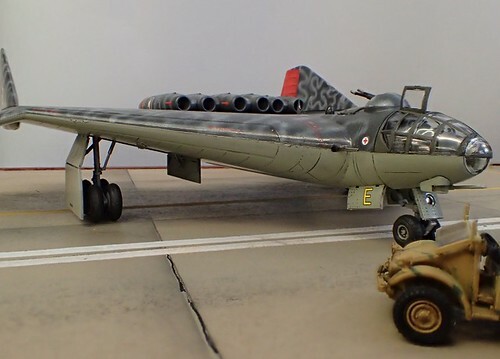 The model in question is Revell's Arado 555(E), the 'Amerika Bomber' concept that was only a paper design, though it does have a certain Indian Jones look to it. 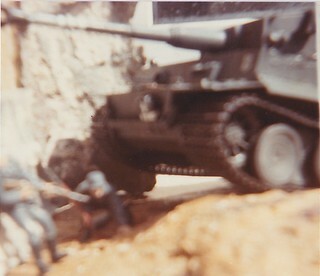 The 1/72 scale model was a really enjoyable build, and quick as it was required for 4th June. There wasn't much deviation from the instructions, but to speed things up I airbrushed the squiggle cam onto the upper airframe while the parts were still on the sprue. The fit being good enough that I could put the pre-painted parts together with minimum clean up. A bulkhead in the cockpit was removed as it fouled the seats and magazines added to the rear turret guns. I lost one of the wing cannon but that turned out to be a blessing as micro tube was used instead looking much finer. After reading tales of a poor fitting canopy on the internet I did delay the final step. Proof that not every internet contribution should be taken as gospel, The canopy fitted perfectly- literally snapping into place. 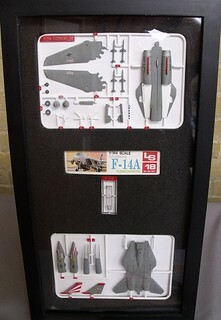 For customers I built the Mobeus ( also boxed by Revell) Battlestar Galactica, and the BA Airbus, also by Revell. 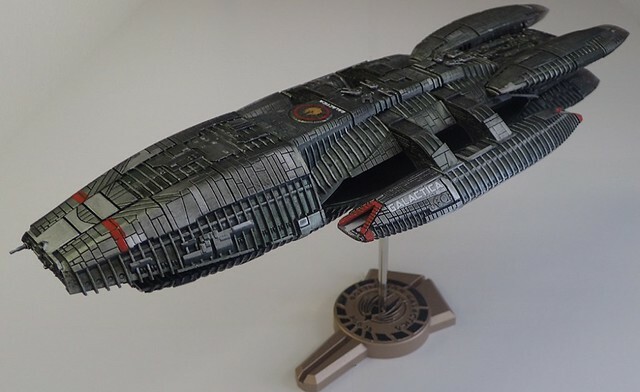 The Galatica was a nice model to paint, I tried out some layering of metallic and coloured varnishes. Build wise I was a little unimpressed as the parts seemed more akin to an unassembled desk ornament. The locating tabs being huge. The decals were on the thick side and very brittle. also anyone tackling this should note that the flight deck needs to be slightly angled rather than straight front to rear, otherwise one end of the 'runway' wont be central to the mouth of the hanger bay. Finally the Airbus reached conclusion. 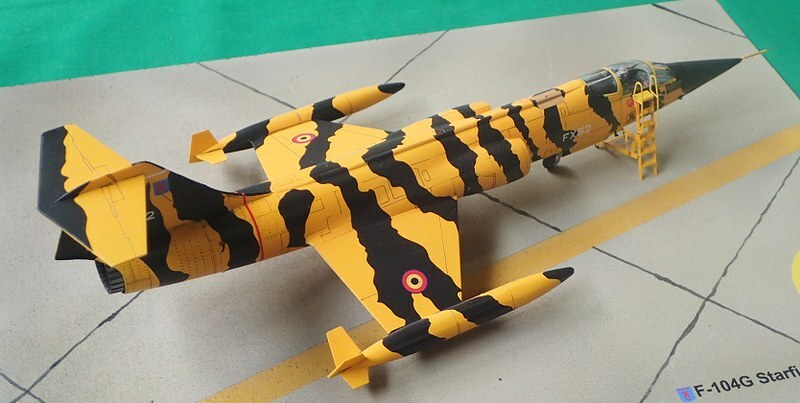 Also a nice kit with a huge number of decals. Dad duties took me up to Norwich to collect my daughter plus all her belongings from university. I couldn't resist stopping in and visiting IWM Duxford. The remainder of my vehicle occupants all complained, wanting to get back to Salisbury as soon as possible, and as I paid the £53.00 for 3 tickets I wondered if I was wasting money on them. Six hours later, with out a single moan through out the day we had to leave. Everyone enjoyed the place. It is massive and we still had a few things left unseen. My daughter is a Concorde fan, my wife found the active airfield interesting and I got to see a few things that are on my 'build' wish list. Maybe next blog will have one started. 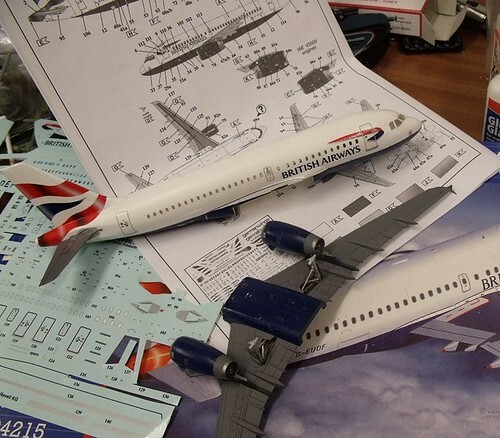 19 Apr 16 My opening photo was initially chosen to show progress on a 1/144 Revell Airbus in BA markings, but as I prepared the picture by resizing and cropping I suddenly realised how cluttered my working area has become, to the point I cropped the picture back more than I'd planned to save embarrassment. In all honesty the advance of clutter has been gradual and brought on by the constant flow of jobs that come into the shop. The Airbus itself is for a customer, nearly finished apart from completing the 140 decals and fabricating a stand to display the aircraft. There is always a queue of Locos in for repair, a Battlestar Galatica awaits starting although I have been gathering suitable research materials, servicing Airbrushes can take longer than expected if a fault needs to be identified, some big R/C projects are suffering from the lack of space, as well as another large painting project and to top it all I allow myself to be swayed by a 'cry for help' and last week completed a 1/72 Spitfire in 3 days to have ready for the top of a lady's Birthday cake for her father. It sometimes seems overwhelming but luckily most people understand if they pop in and their repair hasn't been started yet. In some ways I think many people are glad to have found someone that will look at their problem even if it takes a while, rather than be turned away which seems to be common these days. There is a silver lining to the airbrush servicing. Identifying problems takes a lot of time as it very much is a process of elimination as the first thing to be done is thoroughly clean, and then test. If it isn't working properly it is another thorough clean before assessing what is at fault and once changed test again which of course means another round of cleaning. I get through a lot of cleaning solution. 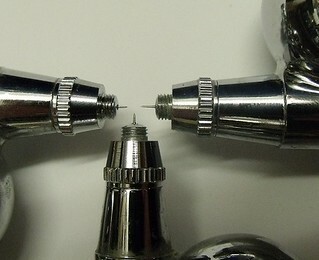 Sometimes the error is so small that it is only noticeable when a number of airbrushes are lined up as the picture shows. The slightly longer needle was a result of being pushed into its nozzle a little to hard, but this was not obvious when viewed on its own. The odd bonus though is during the oft repeated testing I can often get some colour onto a model or two. 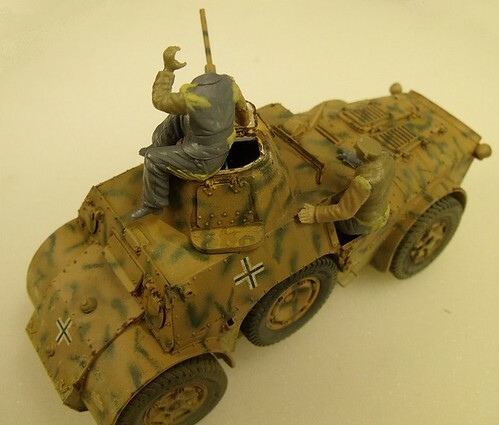 I have no real plan for the smart Italeri 1/35 AB40 armoured car but it has lept forward as a by product of all the recent servicing. I finally said done to my FISTV model and scenic base and put it in the shop window, the delay in finishing seemingly trivial once I wrote down the small outstanding jobs and tackled them during a slow Sunday while stood at the till. I have therefore decided to reduce the number of repairs, commissions and projects I'll be doing once the Summer arrives. I can then give my working area a good clean out as well as tackle a few model builds for myself. That's the plan but I know my arm is easily twisted when dads come in with their little son's who are carrying a sad looking loco. Putting in a couple of extra hours after locking up is worth it when you receive a picture like the one below. Freddie wrote on the back of a photo how grateful he was that I'd been able to get his engine running again. That kind of makes it all worthwhile. 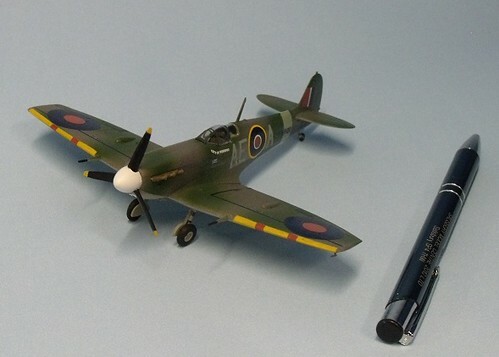 Have fun till the next Blog and don't forget the local IPMS model show on 4th June. 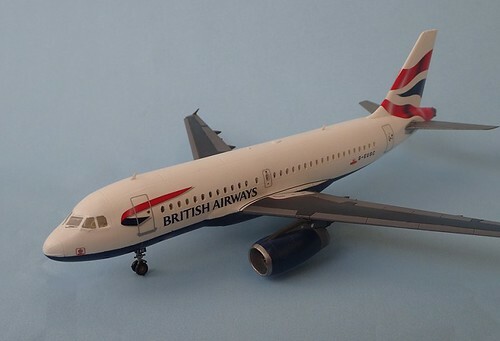 22 Feb 16 It would seem that publishing pictures of customer endeavours 3 days ago was a popular move as I have had submitted a further model from shop regular Ray. 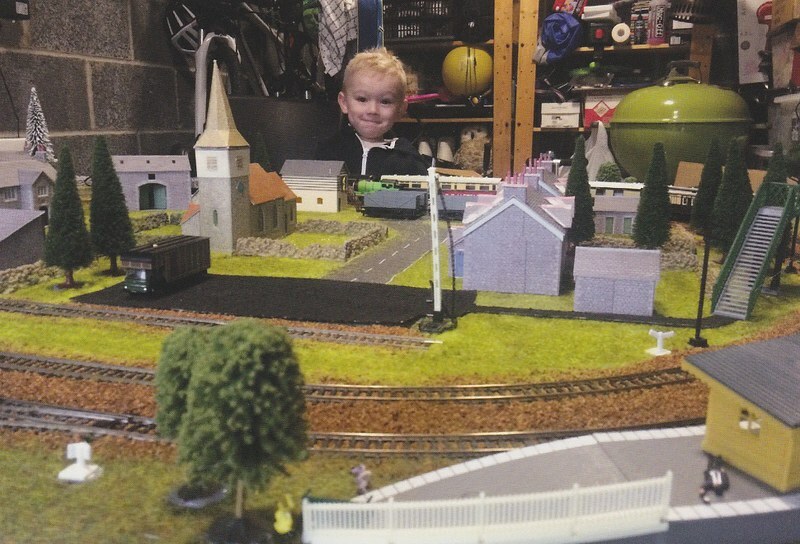 He is a splendid modeller with a fascination for trucks and half tracks, military or civil as well as the odd tractor too. I'm always amazed at the extra details he adds, from brake cables and engine looms to, as pictured here, details relating to the vehicle crew. 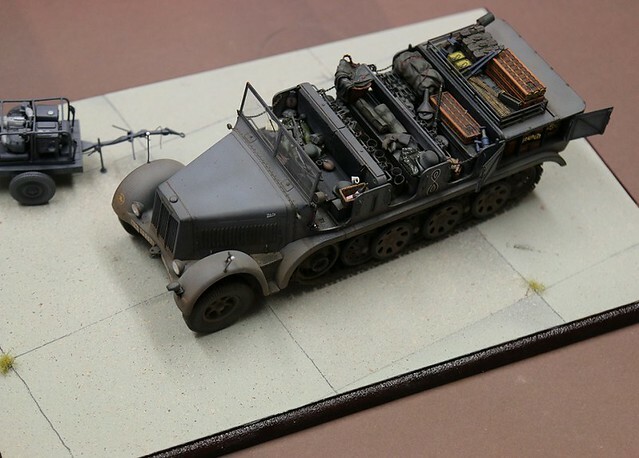 Check out the boots lined up on this Sd Kfz7 Half track. 19 Feb 16 It is always interesting to see what customers have been working on, I get to see a lot of consumables bought, the odd kit too but it isn't very often that I see what the end result has become. Today's Blog will highlight a few of the models done by customers over the past months with a few words about each. Firstly though in continuance of the run of completed commissions, the other kit I was building whilst finishing the 1/15 scale 88mm Gun pictured in the last Blog was Revell's 1/72 Lancaster B.I/III. This was a real gem of a kit, one I thoroughly enjoyed making as it was so well designed and did not require any filler at all. Done 'wheels up' as it was to be in formation with other WWII aircraft flying over a model railway. I'm glad to have a couple of pictures as the model was collected within 2 hours of being finished. I'm willing to be criticised by Lancaster fanatics for having red spinners. I have only found two pictures of Lanc's with red spinners and one of those was a hypothetical captured version. But the customer wanted something that looked nice and not too weathered. The first picture is long over due being posted as I took a photo of this at the Salisbury Model Show. Done by Mike Kenwood it could easily be hung as a framed work of art. He has taken the sprues from a 1/144 kit he didn't really have any desire to make and done something different with them. Each part has been fully finished with paint and decals but left attached to the sprue with the number also picked out. It makes a striking display once mounted in a frame. J Coleman sent me a lot of pictures that had me rather jealous of his skills. He has taken Revell's recent re-boxing of the excellent Zvezda Mi-28 Havoc and finished it brilliantly. This Soviet attack helicopter is in 1/72 scale and looks far better than the rather poor illustration on Revell's box would have you believe. 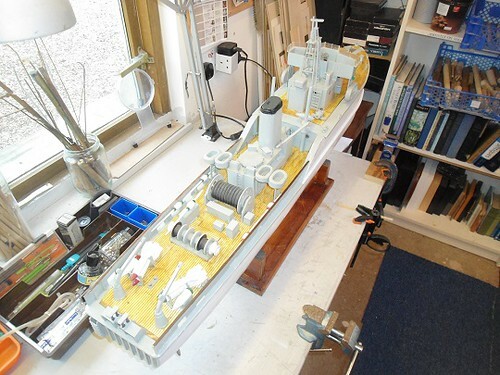 The final picture is from Angus McKillop, a Ton class Royal navy Minesweeper being scratch built from an original Admiralty plan. It has been a very long time in the building as is set to take a few years more but does look like a very competent scratch built ship. All in all a nice look at what other people are working on, I hope your own projects continue as well.